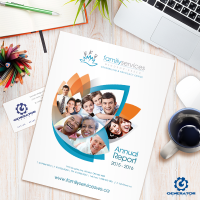 WEHC is a partnership of multiple agencies led by Family Services Windsor-Essex, one of our longtime clients. Working to end homelessness, WEHC provides multiple services for people who are currently experiencing homelessness or are at risk of losing their housing. To give a voice to their work, Generator was asked to create a logo connecting people and housing. The end result is a combination mark logo, with the WECH acronym forming the structure of a house. We also produced for them a clean business card, carrying through the colour scheme of the logo.